“…and the Wall came a tumblin’ down” | "...a better country"
In 1971, my family visited what was then known as West Berlin. 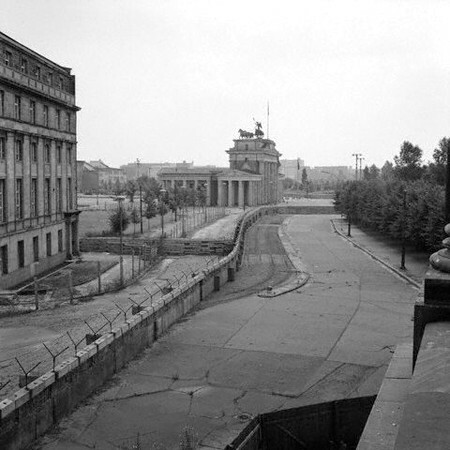 I remember my father, my sister and I standing on an observation post looking over the Berlin Wall into East Berlin. The colorful West was a dramatic contrast with the drab grey of the Communist side. My father told me to make a certain “gesture” with my middle finger to the East German guard on the other side of the barbed wire, tank barriers and no-man’s land. I didn’t – never thought it was smart to insult a man with a gun! Millions died in the name of Marx, Lenin and Stalin in the 20th century. Its been 25 years since the Wall came down. New ideologies have emerged. New walls have been built. The body count grows. But freedom comes – with a cost and in surprising ways. Many gave their lives for the Wall to fall. The other day I met a veteran from “Operation Iraqi Freedom” who fought and was wounded in combat. His wounds are more than physical though and he’s yet to find the way to rebuild his life. I pray for him and the many others this Veteran’s Day who served and still pay the cost.